Happy Monday to all of you. I need to report that here in Maine we did have very mild January and February with very little snow. I kept telling Ward, "this is nice, but we're going to get hit, just wait". Then March came and it has snowed every single day since March 1st. I know it's only March 5th, but 5 days of some type of snow accumulation is not fun for me at all. I had no idea it was supposed to snow last night and was quite shocked when I looked outside to see about 3 ish inches on the ground and on my car. If I had known about said snow, I would have parked the car in the barn. Obviously, snow doesn't keep me inside for running, but I am a big baby when it comes to driving in the snow and I really dislike cleaning off the car and shoveling. 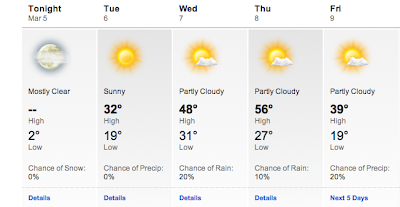 But, looky here...check out the forecast for the rest of this week. That 56F on Thursday is looking mighty awesome right now!!! Especially since it's to get as low as 2F tonight. Brrr. 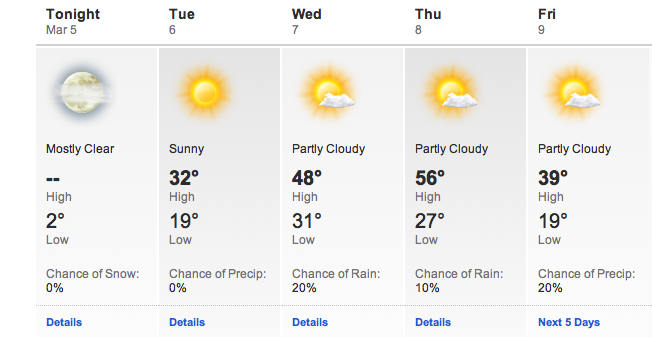 AND there is no snow in sight, well, for the next 5 days anyway. March is a long month, and I'm sure we haven't seen the last of the snow. 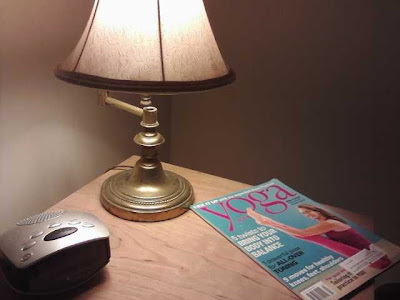 Okay, next up is day #4 of the March Photo of the Day - bedside. Pretty boring. And here's day #5 - Smile. 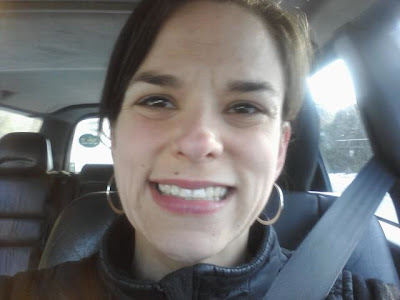 This is me, smiling, just after getting in the car after a very long Monday. Smiling because I am not at work, smiling because I'm on my way home to see my family, and smiling because I'm going to yoga tonight. A dorky smile. But still a smile. Yikes! That is a lot of snowdays! We just got flurries that didn't stick over here in DC. We're suppose to get warmer temps too but I hate it when mother nature teases us like that....guess enjoy the warm temps as much as we can, right? Most definitely, Marie. We need to enjoy them! ooh the nightstand with the magazine? CALMS ME JUST TO LOOK AT. There are many days I WISHED I lived in Florida! So jealous.